The Man From U.N.C.L.E. with Henry Cavill and Armie Hammer. 'The Man from U.N.C.L.E.' box office: Bigger domestic flop than expected? Before I address the box office debacle of Warner Bros.' The Man from U.N.C.L.E., I'd like to remark on the fact that 2015 has been a notable year at the North American box office. That's when the dinosaurs of Jurassic World smashed Hulk and his fellow Halloween-costumed Marvel superheroes of Avengers: Age of Ultron. And smashed them good: $636.73 million vs. $457.52 million. There's more: In 2015, Johnny Depp saw his star dim further following his latest career-imploding box office bomb, Mortdecai; Mark Wahlberg's Ted 2 proved that not all braindead sequels bring in the expected number of asses to fill movie theater seats; and Judd Apatow-Amy Schumer's Trainwreck demonstrated that there's enough room out there for more than a couple of box office friendly female comedians. Last one: starring Dakota Johnson and Jamie Dornan, the R-rated Fifty Shades of Grey presented itself worthy of its (box office) inspiration, Catherine Hardwicke's Twilight, the 2008 fantasy romance that turned Kristen Stewart and Robert Pattinson into household names. Who needs vampire fangs when you have whips and chains? Earlier this year, George Clooney flopped in Brad Bird's Tomorrowland. The aforementioned Johnny Depp and Gwyneth Paltrow bombed in David Koepp's Mortdecai. Bradley Cooper, Rachel McAdams, and Emma Stone bombed in Cameron Crowe's Aloha. Arnold Schwarzenegger and Jason Clarke bombed in Alan Taylor's Terminator Genisys. Channing Tatum and Mila Kunis bombed in Andy and Lana Wachowski's Jupiter Ascending. Chris Hemsworth and Viola Davis bombed in Michael Mann's Blackhat. Yet early summer 2015 was sizzling hot overall – and I'm not talking about the fact that this is about to become the warmest year on record. U.S. and Canada theaters were filled with popular popcorn-and-beer fare like Jurassic World, Furious 7, Avengers: Age of Ultron, Pitch Perfect 2, and Inside Out (popcorn for the parents/guardians, beer for the kids – or whatever). But like Planet Earth itself, summer 2015 is coming to an end with a whimper. In recent weeks, Paul Rudd's $130 million-budgeted Ant-Man opened below expectations – the worst inflation-adjusted debut of a Marvel Cinematic Universe movie – but, perhaps because the competition has turned out to be quite uncompetitive, it has since managed to stay afloat, having to date collected an estimated $153.57 million (in addition to $178.9 million internationally). Hardly a major moneymaker for distributor Walt Disney – in fact, once you factor in distribution and marketing expenses the film in all likelihood is still in the red – Ant-Man is hardly a bomb either once you factor in current and upcoming ancillary revenues that will surely place it comfortably in the black. But no such luck for Chris Columbus-Adam Sandler's Pixels and Josh Trank's Fantastic Four, starring Kate Mara, Miles Teller, Jamie Bell, and Michael B. Jordan, both of which opened and will end with a barely noticeable screech. Indeed, Fantastic Four holds the unenviable record of having the worst debut of a big-budget superhero movie so far this century. 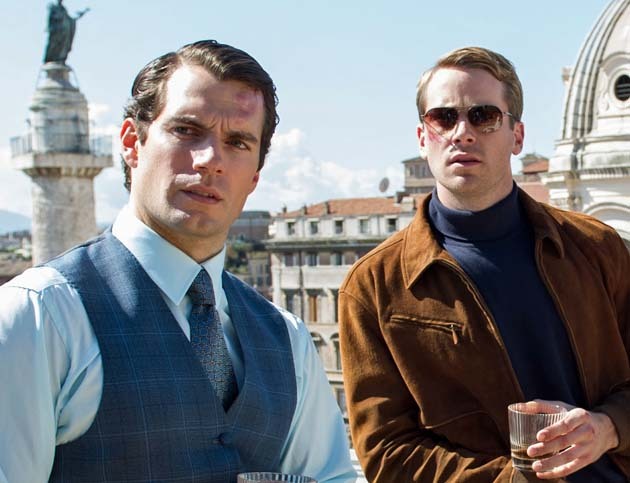 And now comes The Man from U.N.C.L.E., a big screen adaptation of the 1960s television series, directed by Sherlock Holmes' Guy Ritchie and starring Man of Steel superhero Henry Cavill and The Lone Ranger supercowboy Armie Hammer. Had Napoleon Solo and Illya Kuryakin been comic book superheroes, the Fantastic Four bottom-of-the-barrel record would be shattered this weekend. 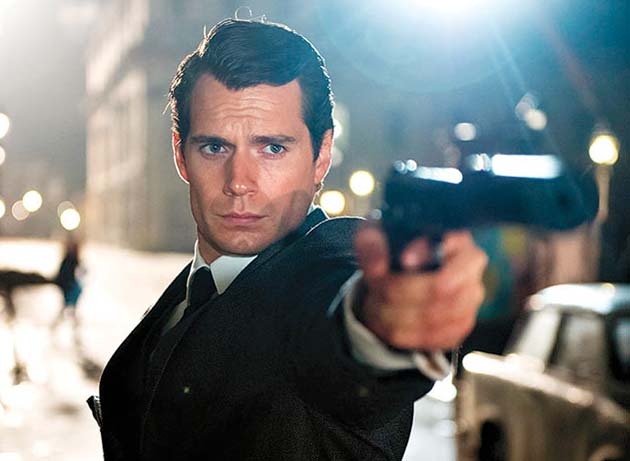 Henry Cavill in 'The Man from U.N.C.L.E.' 2015. Budgeted at a reported $80 million – not including marketing and distribution expenses that could easily lift its price tag to $120 million – Warner Bros.' The Man from U.N.C.L.E. earned an estimated $900,000 on Thursday night (Aug. 13, '15) and a less than expected $4.8 million from 3,638 sites on Friday (including Thursday evening grosses) according to figures found at Boxofficemojo.com. The weekend box office total has been revised downwards: From the expected $17-$19 million range, down to $14-15 million – and now, barring a miraculous Saturday/early Sunday surge – further down to $13-14 million. If this range is on target, The Man from U.N.C.L.E. will be lucky if it reaches $40 million in the domestic market by the end of its run. Sunday, Aug. 16, update: The Man from U.N.C.L.E. collected $13.56 million according to studio estimates found at Box Office Mojo. Matthew Vaughn's R-rated, $81 million-budget Kingsman: The Secret Service opened in Feb. 2015 with $36.2 million, eventually cuming at $128.26 million domestically. In the cast: Colin Firth, Taron Egerton, Michael Caine, Samuel L. Jackson, and Mark Strong. Back in Oct. 2010, Robert Schwentke's $58 million budget action comedy RED opened with $21.76 million (approx. $22 million today), going on to collect $90.38 million (approx. $91 million today) in North America. In the cast: Helen Mirren, John Malkovich, Mary-Louise Parker, Bruce Willis, Morgan Freeman. Adding insult to injury, on Friday The Man from U.N.C.L.E. trailed another humorous thriller based on a 1960s television series: Christopher McQuarrie's Mission: Impossible - Rogue Nation, now on its third weekend out (and the one late summer bright star). Rogue Nation toplines Tom Cruise (who had previously dropped out of The Man from U.N.C.L.E. ), Rebecca Ferguson, Jeremy Renner, and Alec Baldwin. And to think that back in the 1960s The Man from U.N.C.L.E. was so popular that Metro-Goldwyn-Mayer jumbled together several episodes to release them as features – e.g., Joseph Sargent's The Spy in the Green Hat (1967), Barry Shear's The Karate Killers (1967). As for the big-screen try-out, don't expect to see Son of the Man from U.N.C.L.E. or Another Man from U.N.C.L.E. any time soon – or ever. Any dreams Warner Bros. may have had of kicking off a new cinematic franchise have been surely been dashed for all eternity. It's been a bad year for the old Jack Warner studio. The Man from U.N.C.L.E. is the latest WB casualty, following the likes of the Mark Wahlberg-coproduced Entourage, Ed Helms' Vacation (via New Line), Sofia Vergara-Reese Witherspoon's Hot Pursuit, Liam Neeson's Run All Night, Will Smith's Focus, and the aforementioned Jupiter Ascending. The Man from U.N.C.L.E. has a poor 48 percent approval rating and 5.8/10 average among Rotten Tomatoes' top critics. Among the movie review aggregator's critics in general, the film has a much higher – but still only so-so – 67 percent approval rating and a mediocre 6.2/10 average. Oh, yes, for the record: the no. 1 movie at the domestic box office this weekend is F. Gary Gray's musical biopic Straight Outta Compton, about the birth of rap music in the Los Angeles area. Featuring O'Shea Jackson Jr. as Ice Cube, Corey Hawkins as Dr. Dre, and Jason Mitchell as Eazy-E, the film could reach as high as $60 million by Sunday night. It remains to be seen whether or not Straight Outta Compton is a true crossover hit; we'll know by next weekend. Either way, don't expect it to be nearly as successful internationally. The studios' official weekend box office estimates come out on Sunday morning. Weekend box office actuals will be released on Monday. 'The Man from U.N.C.L.E.' trailer with Henry Cavill and Armie Hammer. Hugh Grant. Alicia Vikander. Elizabeth Debicki. Luca Calvani. Jared Harris. Sylvester Groth. Misha Kuznetsov. Christian Berkel. Guy Williams. David Beckham. Guy Ritchie and Lionel Wigram (Sherlock Holmes) were credited for the screenplay, from a story by Ritchie, Wigram, David C. Wilson (Supernova), and Jeff Kleeman (one of The Man from U.N.C.L.E. producers). The television series ran 1964-68. Robert Vaughn and David McCallum had, respectively, the Henry Cavill and Armie Hammer roles. Leo G. Carroll (Spellbound, North by Northwest) had the Hugh Grant part. Joan Crawford. Eleanor Parker. Senta Berger. Janet Leigh. Jill Ireland. Carol Lynley. Anne Francis. Vera Miles. Chad Everett. Albert Dekker. Angela Lansbury. Paul Lukas. Patricia Medina. Jessie Royce Landis. Mala Powers. Kathleen Freeman. Leonard Nimoy. Dan O'Herlihy. Julie London. Patsy Kelly. Elsa Lanchester. France Nuyen. Kim Darby. Leslie Nielsen. Dorothy Provine. Herbert Lom. Terry-Thomas. Barry Sullivan. Joe Mantell. Eddie Albert. William Shatner. Telly Savalas. Joan Collins. Cesar Romero. Juliet Mills. Michael Ansara. Eve Arden. Anne Jeffreys. Jack Lord. June Lockhart. George Sanders. Charles Ruggles. Susan Oliver. Ricardo Montalban. Jack Palance. John Carradine. Curt Jürgens. Allen Jenkins. Kurt Russell. Armie Hammer and Henry Cavill The Man from U.N.C.L.E. images: Warner Bros.
Open Channel “D” for Disappointed, Deceived, Disaster for what was so highly anticipated by Man from UNCLE TV fans who have been waiting 1/2 century for the big screen version, this was all “Man” and NO UNCLE. Other than the title and the names of the 2 main characters, not one bit of the TV show, not even the theme (other than a 2 sec piece over the radio) was used. It wasn't until the ending credits that anyone even mentioned what UNCLE stood for. As a “stand-alone” movie it was OK, but why would anyone spend a huge part of their budget for the rights to a name and not use any of the original plot? At least we will always have re-runs available on METV network and DVDs. And, of course that fantastic novel “Undercover Reunion” by Raven West which is a true tribute to the original series and a true Man From UNCLE fan pleaser!